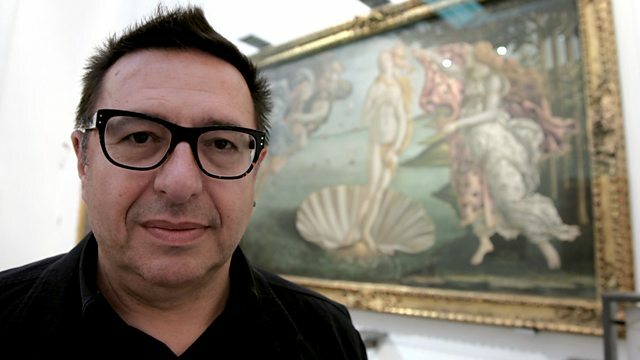 Ahead of his BBC4 series Renaissance Unchained, art critic Waldemar Januszczak conjures up the sound world of this epoch of huge passions and powerful religious emotions across all of Europe. The term 'Renaissance', or 'rinascita', was coined by Giorgio Vasari in 16th-century Florence, and his assertion that it had fixed origins in Italy has since influenced all of art history. But what of Flanders, Germany and the rest of Northern Europe? Waldemar presents music from the time of the Renaissance greats: Jan Van Eyck, Hans Memling, Albrecht Dürer, Hieronymus Bosch, Pieter Bruegel, Botticelli, Michelangelo, Leonardo and El Greco. Waldemar Januszczak challenges the traditional view of art's most important epoch. Philip Dodd chairs a Landmark discussion about Dante's poem The Divine Comedy. Matthew Sweet is in Holland for an exhibition celebrating the artist Hieronymus Bosch. Performer: Tallis Scholars. Performer: Peter Phillips. Performer: Ann Allen. Performer: David Hatcher. Singer: Sophia Brumfitt. Singer: Katherine Hart. Singer: Jenny Cassidy. Performer: Piffaro, The Renaissance Band. Performer: Tallis Scholars. Director: Peter Phillips. Performer: La Chapelle Royale. Performer: Philippe Herreweghe. Performer: Sistine Chapel Choir. Director: Massimo Palombella. Ensemble: The Philadelphia & Cleveland Orchestra Brass Ensembles. Performer: Concordia. Singer: Ana-Maria Rincon. Director: Mark Levy. Performer: Concordia. Director: Mark Levy. Performer: Ana-Maria Rincon. Performer: Concordia. Director: Mark Levy. Performer: The Sixteen. Director: Harry Christophers.